Off the charts. That's what forecasters said as soaring temperatures shattered records throughout California, including one wet more than a century ago in Santa Cruz..." The article went on to say that the previous high for this day was 88 degrees, back in 1899. So, on Monday when temperatures soared to 96 degrees, Andre, Daniel and I rode our bikes down to the beach. Daniel was sleepy, so we laid our blanket down in the shade of the cliffs and Daniel promptly took a nap. 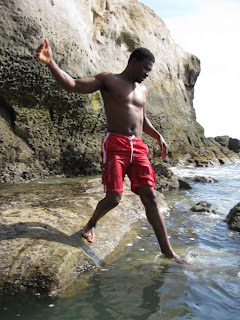 Meanwhile, Andre and I ventured toward the water. 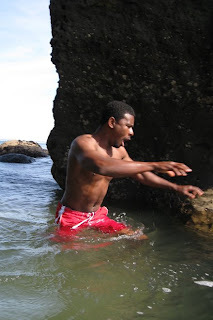 I've lived in Santa Cruz since 1980 and have probably only gotten into the ocean water a handful of times. I've heard that our currents come down from Alaska, which explains why the water is so cold compared to San Diego beaches where the currents come up from Mexico. 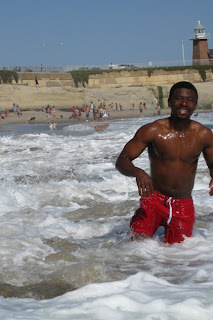 Even in 96-degree weather, the cold water was shocking at first, but gradually we got used to it (or completely numb). 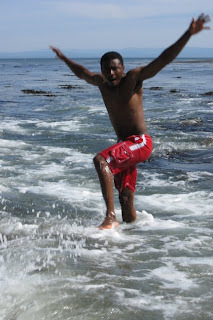 I was so thrilled to Andre taking on the waves and having fun, just like a child. I remember when I first met him and he was too terrified of sharks to go into the ocean. 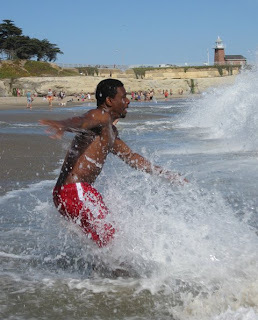 There was just one downside to the day -- I got too bold with my photography until a huge wave knocked me and the camera down. I recovered, with only bloody knees, but the Canon Powershot was a goner. Luckily, the memory card still functioned, so you can enjoy these photos.